This is a very special, tasty, simple and mild sweet rice, slightly different from Iyengar special akkaravadisal and sakkarai pongal. 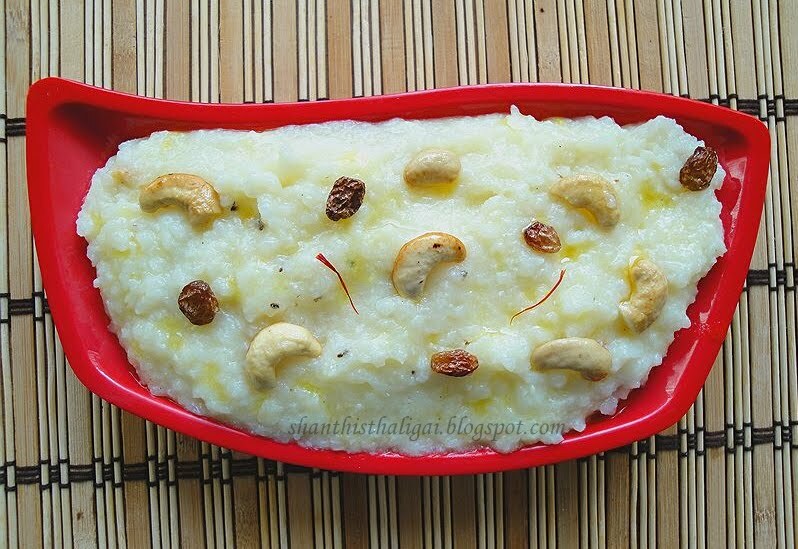 It is made as an offering and also served in Iyengar marriages. A great offering indeed. Soak saffron in a tablespoon of hot milk. Fry cashews and kismis in a spoon of ghee. Keep aside. Wash rice. Drain the water completely. Pressure cook rice in milk for 4 whistles. While hot, mash the rice well. Add kalkandu to the mashed rice and mix well on stove. Its not necessary to powder the kalkandu. It automatically dissolves in a few minutes on heat. While mixing the texture becomes watery, do not panic, it will thicken when warm. Thanks for sharing this delicious dish with us aunty.. Happy Pongal!!! Never tasted this delicacy.Promises to be very delicious. Love to have a bowl of this irresistible sadham. Looks super delicious. Just prepared today for Kanu..